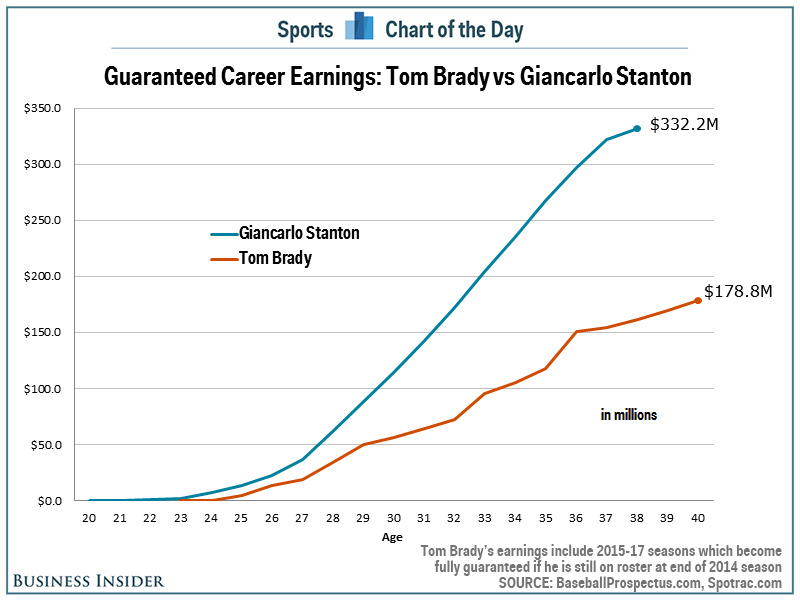 Tom Brady is the second-highest paid player in the NFL history having made $US154.8 million in his career so far thanks to a resume that includes two MVP awards, three Super Bowl rings, and the honorary title of being one of the greatest quarterbacks ever. 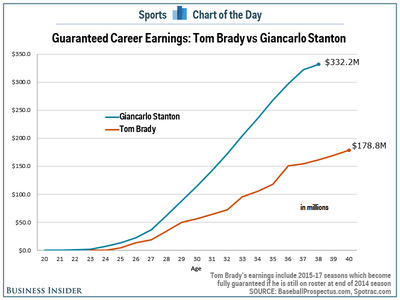 And yet, Brady’s career earnings still pale in comparison to what Giancarlo Stanton will make in his career after the Marlins outfielder signed a 13-year, $US325 million guaranteed contract, the largest in North American sports history and that is a terrible sign for the future of the NFL. While Stanton is a superstar in the making and the Marlins will benefit financially by having him around for 13 years, he has yet to win an MVP award, has never played in a playoff game, and has yet to even play for a team that his finished a season with a winning record. Star athletes in high school are going to see the amount of money that is being made in baseball and then they will think about football’s shorter careers while parents think about the ongoing concussion crisis. The result will be more star athletes are going to abandon football (if parents even let them start) and turn to baseball and all the NFL’s player safety rules won’t be able to stop it.